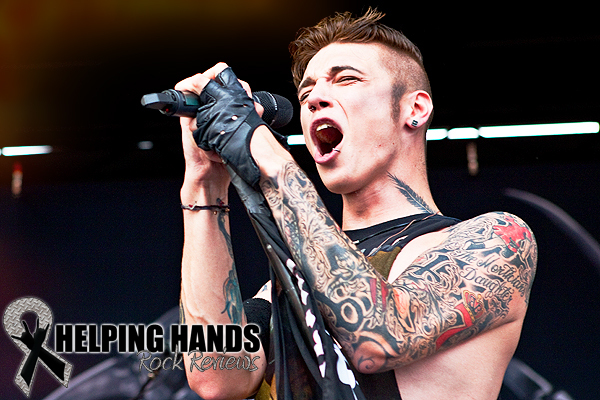 When I heard that Black Veil Brides were coming to town, I thought to myself, “I must cover this for Helping Hands Rock Reviews! 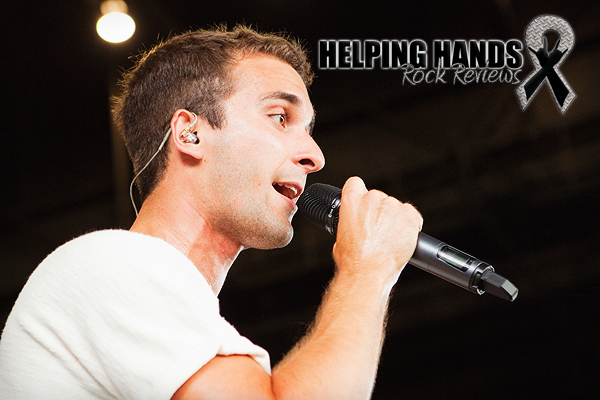 !” I did a little further research about the show and I learned that they would be coming to town on the Vans Warped Tour. Despite it being around for 19 years, I never actually attended it. Nor did I know much about it. I honestly thought that it was just another tour with 5 or 6 bands of the same genre touring together. Ha! Was I ever wrong! Once I got approval to cover the show I knew it was time to do some research. I obtained my copy of Vans Warped Tour ’13 compilation CD and went to work. I made a healthy sized list of all of the bands that stood out to me and decided that those were the bands that I would focus on. Sounds simple enough, right? Well, not quite…. I arrived at First Niagara Pavilion in Burgettstown, PA a little before noon. This is much later than I had planned as I hit some heavy traffic on our unpredictable highways here in Western Pennsylvania. 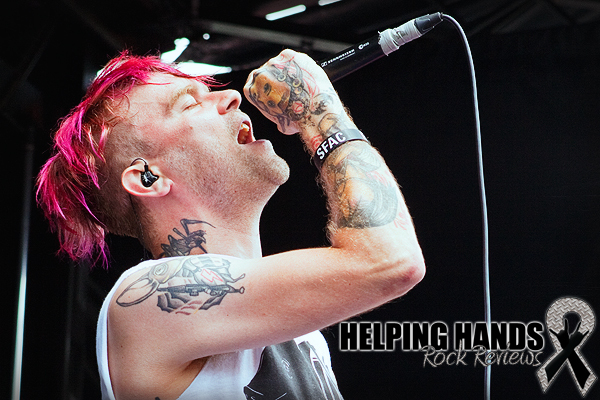 As I am waiting in line I become aware that one of the bands on my list, Hawthorne Heights, is nearly finished playing! Wow, I haven’t even gotten through the gate and that’s one band that I already missed! I walk in and feel something dripping on me and I realize that it’s my own sweat. I haven’t even been here but 2 minutes and I am already melting under the 90+ degree direct sunlight. 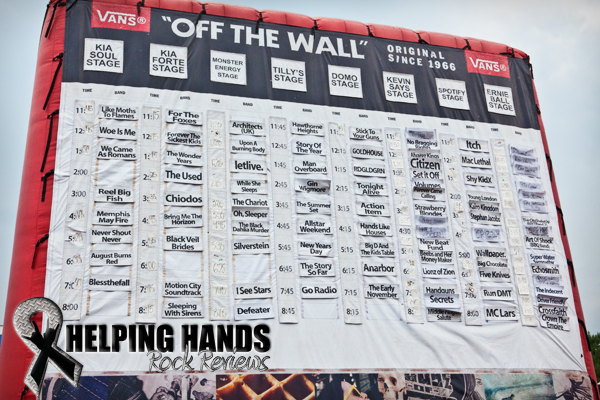 One of the things that I learned about Vans Warped during my research is that they have a large inflatable sign with all of the bands playing and at what time and what stage. Finding that was my first mission. 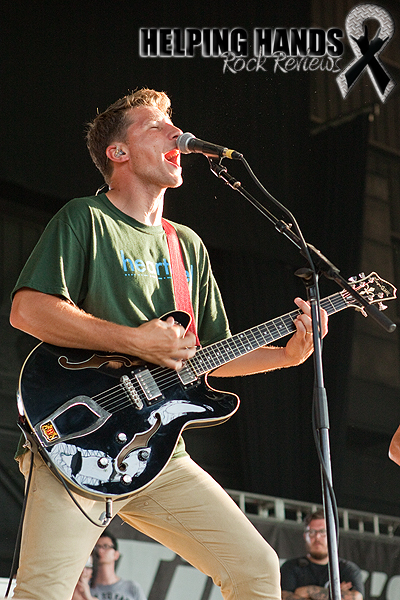 An interesting fact about Vans Warped Tour is that the bands do not play at the same time at every show. So there was no way to know ahead of time when any of the bands would be playing. After trekking though thousands of people and hundreds of vendor and band tents, I see the big red sign. I am feeling relived until I look up and see all 90+ bands on 8 different stages listed on this giant red balloon. I’m pretty sure that everyone around me could hear the little voice inside my head screaming in panic. For a moment I feel as though I have just opened up an extra-large box of Whitman’s Sampler candies and there are so many new and somewhat familiar flavors to try! I take a snapshot on my phone and bust out my old school notebook and pen. I know that I absolutely cannot miss Black Veil Brides so I seek them out first. After feeling like I was playing one of those word search puzzle book games, I finally found them and I let out a big sigh of relief as I learned that they would not be going on until 5:55. This would give me plenty of time to get my bearings straight and figure out my way around this musical maze. On the schedule playing at that very moment was Pittsburgh’s own Lovebettie on the Ernie Ball stage so I figured that would be a great place to start. So off I went, searching, searching and still searching. After more sweat and confusion, I realize that it’s too late. Their set is certainly over by now. I never did find that stage. This made me a bit anxious and the heat certainly was not helping me to feel better. I decided to sit down and try to figure out what to do next. I’ve been here nearly an hour and I haven’t even taken my camera out of the bag! As I go over my list and look at the photo of the schedule I notice an ominous looking sky. Oh no, not rain! I am feeling completely overwhelmed at this point and worried that I am not going to accomplish what I set out to do today. Rain is pouring all over me as I run under the closest shelter. Oh wait, this shelter is the Acoustic Basement which is another place to see live music! This place isn’t mentioned the big red sign. I smile to myself as I realize that I get to hear some music and stay out of the rain! Maybe this day will get started after all! 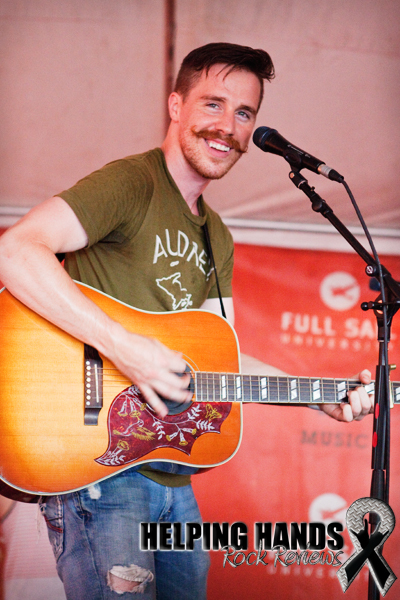 At this point I do not know that I am watching John Bee of American Opera but I do know that his songs are catchy and that he reminds me of Butch Walker in a way. He seemed quite pleased that the tent was filling up with people despite the fact that they were mostly trying to stay dry. I knew that I’ve finally reached the moment where it was time to pull the camera out of the bag. So I took a few shots and enjoyed the rest of his set as it rained cats and dogs outside. The rain started to clear but not enough to take the camera out in it just yet so I stuck around for a couple of songs by Billy The Kid from Vancouver. I enjoyed a tune or two of hers until she had some technical difficulties that inspired her to make a comment about not being able to hear her guitar over all the “[expletive] heavy metal bands” playing. Her comment reminded me that it was time to move along to get to the reason I was here, the harder stuff. 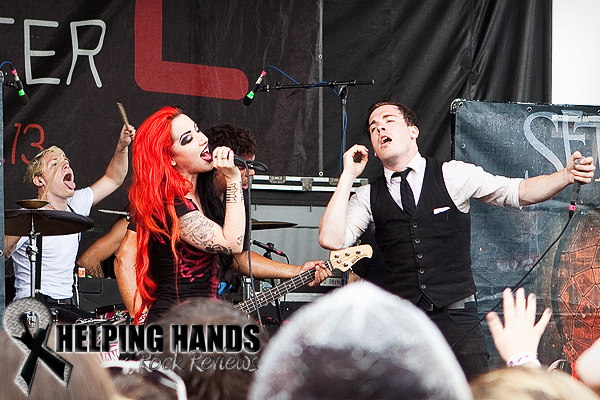 As I wander off into the crowds of now soaking wet music fans, I spot a stage nearby and I recognize the ultra-awesome half black and half red hair of Ash Costello, the singer of New Years Day. This thrills me as they were on my list of bands to catch but they were scheduled to play at the same time as Black Veil Brides. As I get a little closer, I become aware that she is actually performing a song with the band Set It Off. Even though it was nearly the end of their set, I was glad to have caught them and snap a few shots of their circle-pit inducing performance. Looking at the time, I realized that I’ve finally reached the point where there is a band on my schedule that is almost due to start playing and I know where the stage is and I can actually get there before they start so I can get my 3 songs worth of shooting in! I wander over to the Kia Forte stage where The Used is about to go on for their colorful and energetic set. At one point, singer Bert McCraken throws out some sort of colored dust to the crowd which leaves one photographer in the pit glowing like a rainbow. After what only seems like 2 songs, security shoos us shooters out of the pit. 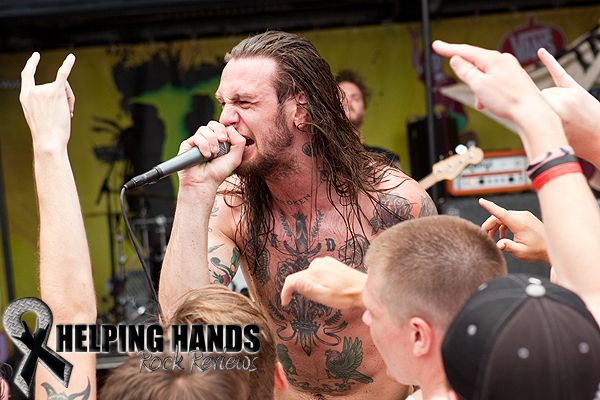 As I am walking out of the pit, I notice another band well into their set over at the Monster Energy Stage so I decided to take a few pictures of Lawrence Taylor of While She Sleeps as he gets up close and personal with the very enthusiastic crowd. 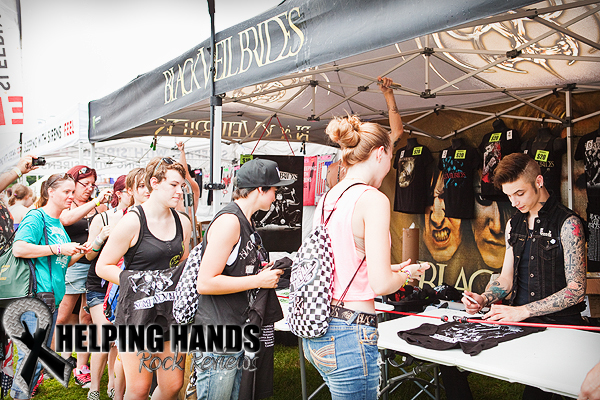 I realize that I may have enough time to pass by the Black Veil Brides tent to see if I can get any shots of Andy Biersack who is signing autographs. I make my way through a group of girls nearly in tears of joy as they leave with their freshly autographed items. I grab about 3 shots of the excited fans and Andy just as security starts giving me a hard time. They are not interested in my press pass and tell me that I need to move on. 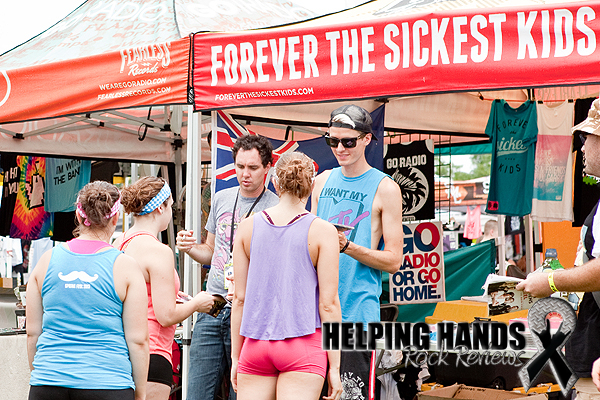 Whatever, I got what I came for so I mosey on to the Forever The Sickest Kids tent where they don’t seem to mind me photographing them as they sign stuff for their fans. Since Juliet Simms isn’t going on for a little while, I decide to dig into the Whitman’s Sampler box and try out something that I’ve never heard of or tasted before, Action Item. I was surprised by their catchy radio-friendly sound as it was a bit different from some of the other music that I sampled that day. Judging by the high-pitched squeals behind me, I was guessing that these guys were a big hit with the young ladies. 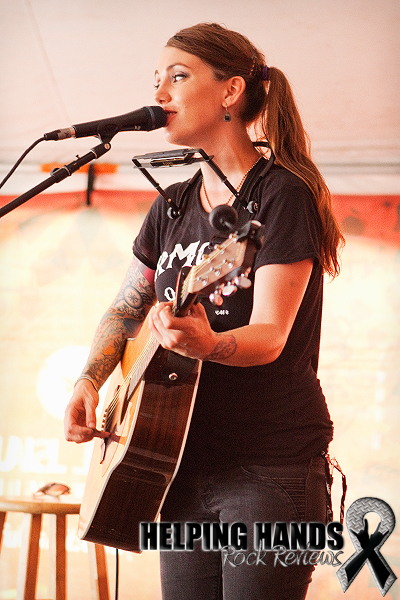 Having trouble once again finding the stage I am looking for, I stumble upon Juliet Simms a little late. Luckily the security guard didn’t mind letting me back for pictures even though her set had started. As I’m snapping away I realize that her boyfriend, Andy Biersack from Black Veil Brides, is watching from the side of the stage. This made for some great Kodak moments! I only knew of Juliet Simms because of my interest in Black Veil Brides. Being a runner up on the second season of ‘The Voice’ was something that I only recently learned as I never watched the show. Her amazing voice blew me away as she belted out her own songs as well as a couple of covers tunes by The Police and James Brown. She gained another fan that day. Excitement growing inside of me, I decided to head on over to the stage where Black Veil Brides will be playing shortly to shoot Bring Me The Horizon. 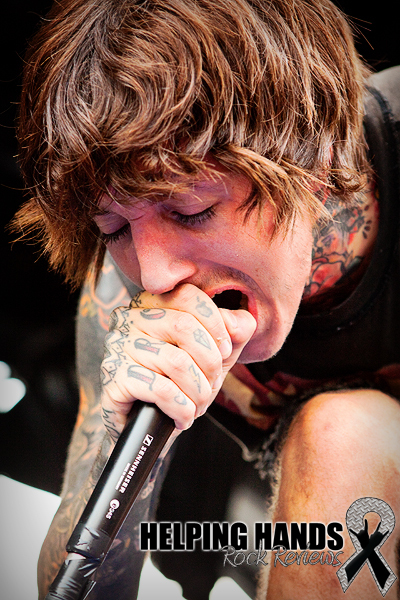 The singer, Oliver Sykes, has such a fantastic stage presence and is a joy to shoot. He’s not afraid to get close to the photographers’ pit! Once again, I notice another band playing on the Monster Energy Stage. Come to think of it, there was never a moment when there wasn’t a band playing somewhere! 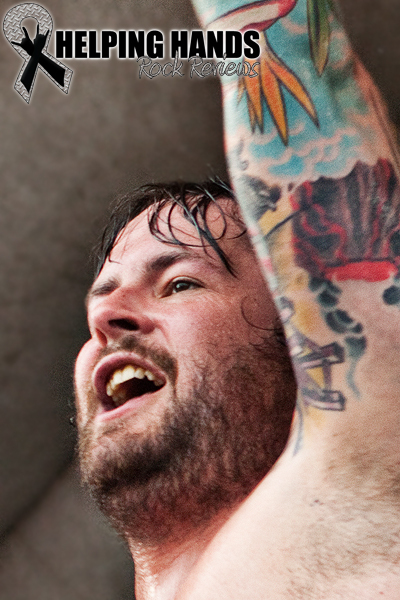 I was just in time to catch a few tunes from The Black Dahlia Murder and take a few photos. Not wanting to go far from the stage that Black Veil Brides will be hitting very soon, I bounce on over to the stage right next to it, unaware of who I’m about to photograph. On comes a poppy sounding - perhaps a tad Beatles-influenced - three piece band by the name of Never Shout Never. Now is the moment that I’ve been waiting for, the triple chocolate truffle in that gigantic box of Whitman’s Candy Sampler, Black Veil Brides! For a moment, I almost forgot that I was here with a job to do. As they took the stage with “I Am Bulletproof” I couldn’t help but to smile and mouth the words along behind my camera, hoping that none of the security guards or photographers noticed me. Their energy was everything that I expected and more being this up close and personal. As I’m machine gun style shooting them as to not miss a single moment, I start to realize that my time in the pit is almost up. I get my last shots and we are all directed out of the pit. I put my camera away and join the crowd and continue rock out to the rest of the show where I don’t have to contain my excitement! Exhaustion is starting to take over me so I head under the pavilion to rest and recheck the schedule to see who else I should catch before Sleeping With Sirens at 8:15. As I’m resting, I realize that a band that I never heard of before called The Early November is about to hit the stage. This was one of those coconut filled candies - sweet, but not for me. It’s obvious that others are into that flavor and that is totally cool. 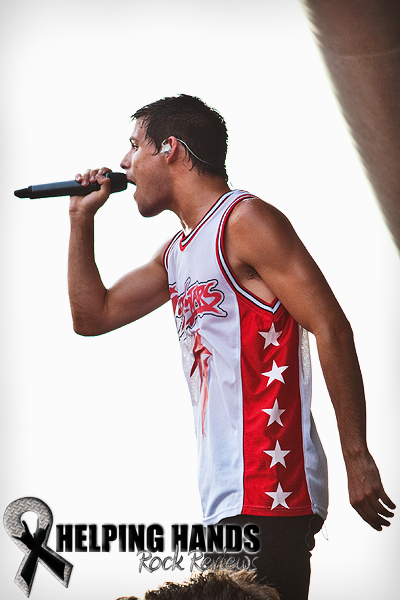 I’m learning that is the beauty of Vans Warped Tour, there a something for everyone. On my way back to the Kia Forte Stage, I notice some moshing going on and a sound that I like. I’m too late to enter the photo pit for I See Stars, but I grab a few shots from the crowd as I enjoy the last few songs of their high-energy set. And now it’s time to have that one last candy from the box for if I were to have any more, I might possibly feel sick. As soon as Kellin Quinn of Sleeping With Sirens takes the stage, the high shrieks of his adoring fans rise behind me. 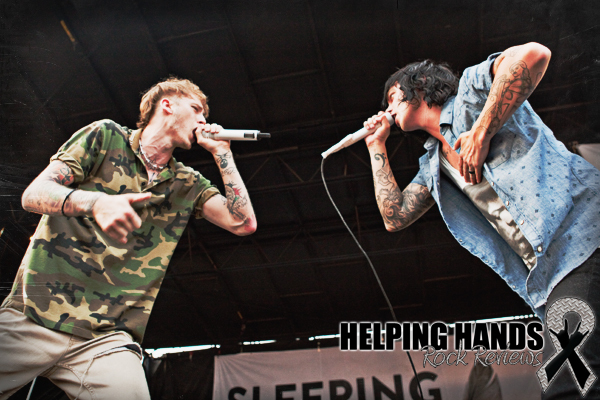 Eventually, Machine Gun Kelly takes the stage for a song with the band. One more tune and my day is done. I really wanted to stay to hear more, especially “Do It Now, Remember It Later,” but the truth is there comes a time when you need to put that box of Whitman’s Sampler chocolates away. No matter how tasty they are, it’s just impossible to eat them all. Very much like the Vans Warped Tour which is very delicious with all of its varieties but it’s just impossible to take it all in on one day. As I close the lid on this tasty assortment of music, I smile to myself in satisfaction for I have walked away with new favorite flavors that I had never tried nor in some cases even heard of before. 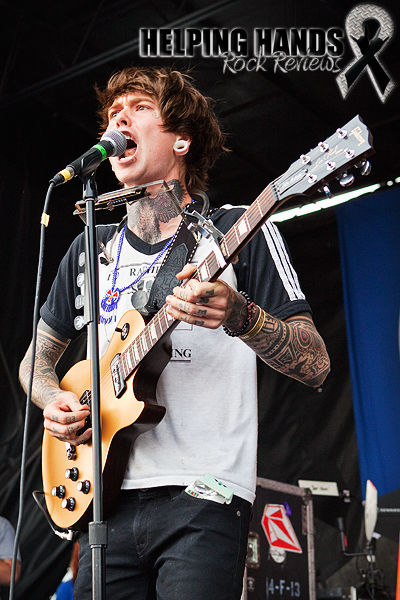 Vans Warped Tour is an excellent place to taste test all kinds of music and I can’t wait to do it again next year!